A massive global rally in treasuries is underway and gold may be headed for its biggest one day advance in history as global systemic distrust sets in. Please see Global Financial Seizures Continue, Gold Soars for more details. The above chart courtesy of Bloomberg. Interest rates can only go as low as zero. This may be as close as we get. 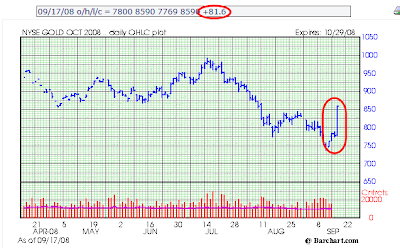 The above chart is as of 1:00 PM Central, and is courtesy of BarChart. The Fed is desperately attempting to free up the system with mammoth injections of short term repos. The problem for the Fed is no one trusts anything but treasuries and gold. Inquiring minds may wish to consider Treasury Bull Alive And Kicking for a discussion of what asset classes are likely to do well in a deflationary crash. 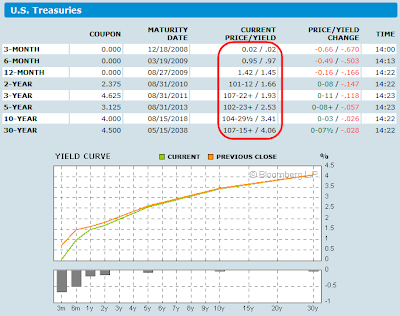 After I finished the above post I found a reference to the all time historic low in yields. Bloomberg is reporting Treasury 3-Month Bill Rates Drop to Lowest Since World War II. The three-month bill rate has averaged about 3.44 percent in the last decade. It touched 0.01 percent in January 1940, monthly figures on the Fed Board of Governors' Web site show, as investors sought the assurance of getting their principal back. Daily figures only go back to 1954. "The panic going round the money market world is what they've been investing in is not as safe as they thought it would be," said Dominic Konstam, the head of interest-rate strategy in New York at Credit Suisse Securities USA LLC, another primary dealer. "If the banks don't want to lend to each other they don't want to lend to the banks. That means where else are they going to put their money -- they're going to put it in T-bills for safety." "I'm extremely worried about what is happening to the money market mutual funds that have announced they've broken the buck," said Ajay Rajadhyaksha, head of fixed-income strategy at Barclays Capital Inc. in New York. "That unfortunately can spiral in the sense that it makes it more difficult for all companies to raise short-term money because the money-market funds tend to be buyers of short term debt." Central banks around the world pumped more than $280 billion into the financial system this week to ease a credit- market seizure. The Fed will loan up to $85 billion to AIG, the biggest U.S. insurer by assets, in exchange for control. The AIG rescue "smacks of sweeping the problem under the carpet rather than solving it in a structural sense," said Padhraic Garvey, head of investment-grade debt strategy at ING Bank NV in Amsterdam, in a note to clients. "We are still in the midst of the flight-to-quality environment." I just happened to be checking on rates exactly as the low was hit. 3 month yields are now .04.